Alert to whole Jain community, followers and heritage lovers…. 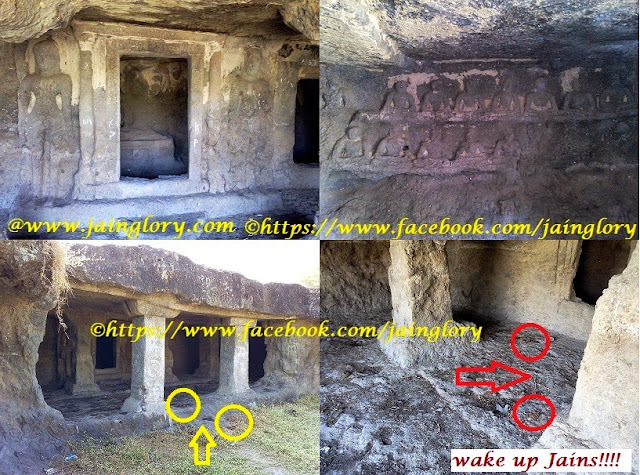 It is time to wake up for all Jains and Heritage Lovers !!! Jai Jinendra to All. Today, I am presenting a shameful, unfortunate but true picture of our carelessness. Let’s move to Ambajogai (District – Beed, MH) place again via this post, where ancient (12th century) Jain cave is situated but its existence is almost decayed. The 12th century’s ancient cave has been being used as a public toilet and lavatory by heinous people. Our heritage has been encroached, converted and appropriated by anti-social people. Ignorant people who do not have knowledge of Archaeology, ancient heritage and Jainism made our ancient Jain cave temple a public lavatory and toilet. Ancient Ambajogai Jain caves are in grave danger and vulnerable to conversion by encroachers. Please read the great glorious history of this cave and decide that what actions should be taken to preserve ancient heritage. Due to negligence and lack of proper care by Jain community and Archaeological Survey of India, The cave is falling to decay very rapidly. The whole cave structure is somewhat obliterated by deterioration due to continuous flowing water in river Jayanti in rainy season time. Our JainGlory team had reached at the cave after a long search of the cave. We almost made dirty ourselves to visit the cave. Although, our noses had to close – but we became emotional to see such shameful condition of the ancient cave. We clicked some photographs for proofs and shown respect to the creator of the cave and bow to the decayed, carved images of Jina. The most unfortunate thing was- none of Jains had told us about the cave and the way to reach there even after asking again and again. Probably they knew the facts and they were supposed to expose in front of all. I would like to tell all people that we have to pressurize MLA, MP, ASI and Jain Society of Ambajogai regarding safety, cleaning, and arrangements of the ancient Jain Cave. Let’s read about the cave and its history in detail. Ambajogai Jain cave: - Ambajogai town has a great ancient Jain temple which has been detailed in our previous post to https://www.facebook.com/jainglory . Ambajogai Jain cave is situated at the bank of river Jayanti which passes through heart of the ancient city Ambajogai. Today River Jayanti is in the form of a canal which has very few meters breadth and the river cuts the town in two halves and its bank is abode of several temples, caves and ancient monuments concerned to different creeds. Brahamanical and Jain monuments are situated in vicinity of the town Ambajogai. The famous Hathikhana caves which is concerned to Brahmanical creed and consecrated by Rashtrakoota or Parmara sovereign Udayaditya of 1066 AD. The Jain cave is situated to about half kilometer to Yogeshwari temple and about 200 meter apart from Hathikhana caves on opposite bank of river Jayanti. The Jain cave is constructed in plain hill feature and its interior is consisted by Sabhamandapa and Pakshamandapa. As we enter the cave temple we are welcome by two Elephants structure which are comparatively smaller than Hathikhana cave’s elephants. The eastern side of the structure contains a spacious Sabhamandapa which was used for assembly in Jain temple anciently. The cave contains two pakshamandaps wiz north and south pakshamandapa. The interior of the cave contains pillared structure which is purely rock cut and carved out in the hill itself. In the Sabhamandapa there are three inner shrines which accommodate the ancient Jina sculptures along with Pratiharya. The middle inner shrine is dedicated to 23rd Lord Parshwanatha which is attended by two whisk bearers. The Jina is delineated in meditation posture and seated on a Lion throne. The cobra hood is so obliterated that it is beyond recognition to Jina Parshwantha. The whole image is too hard to identify due to continuous deterioration. On the either side of the gate to this inner shrine, there are two Jina sculptures of 5 feet height depicted in kayotsarga posture. The faces of these sculptures are also defaced and obliterated. On the right side of this inner shrine; in the south Pakshamandapa there is a cell which contains a Teerthankara sculpture in Padamasna posture on a Lion seat. The Jina savior’s sculpture is attended by whisk bearers on either side. This image is also much defaced and obliterated. Scholars claimed this sculpture as Jina sculpture of Parshwanatha. On the right wall of the cave; in the south pakshamandapa there are 24 teerthankara carved in three rows which all are in meditation posture. Third row of these sculptures is obliterated and now hard to trace. In the north Pakshamandapa there is a cell which contains Jina sculpture of teerthankara which is speculated as Rishabhanath delineated in meditation posture seated on Lion seat. This sculpture is also much defaced and obliterated. Outside the Sabhamandapa, there is a cell which is situated at left side of cave structure in open courtyard. The cell also contains a Jain sculpture in padmasana posture meditating and seated on lion throne. This cell is filled with water flowing from Jayanti River during rainy season. On the opposite side of this cell there is also one other cell which is vacant and perhaps was abode of Jaina ascetics in ancient time. In the middle of the cave there is a place which holds the Maanstambh but alas!!! The Maanstambh is not present today and perhaps it was transported to the city’s Jain temple. History of Ambajogai Jain Cave: - As there is no inscription found in the Jain cave governing the construction time of the cave but an Inscription is found near in the Hattikhana Brahmanical cave attesting that the caves were consecrated in 1066 AD by Mahamandaleswara Sovereign Udayaditya who reigned to 1060-1087 AD. Thus we can speculate on the basis of artistic similarities, architecture and craft that the Jain caves were constructed in the same period of Mahamandaleshwara King Udayaditya. Although Ambajogai town found its supreme position, fame and glory under reign of Yadavas like Jaitrapala in 12th century but Jainism had been already deep rooted in this region. The city of Ambajogai got several Jain sovereigns during medieval period which contributed to Jainism in a great way. Finally, I would like to tell all people that we have to pressurize MLA, MP, ASI and Jain Society of Ambajogai regarding safety, cleaning, and arrangements of the ancient Jain Cave. Even after reading this post we do not wake up, it would be more unfortunate. In that case, we all would be responsible of destroying our own heritage.